In October 2010, as Time Master: Vanishing Point was just rolling out, I asked "Which character would you like to see as Booster Gold's future wife?" The winner of that poll was Trixie Collins. In November 2015, after Convergence revealed all DC Continuities still existed, I asked "Which character would you expect to see revealed as Booster Gold's future wife?" Trixie won that vote, too. So who will win this year? One guess. People like Trixie. I don't blame them. I like her, too. 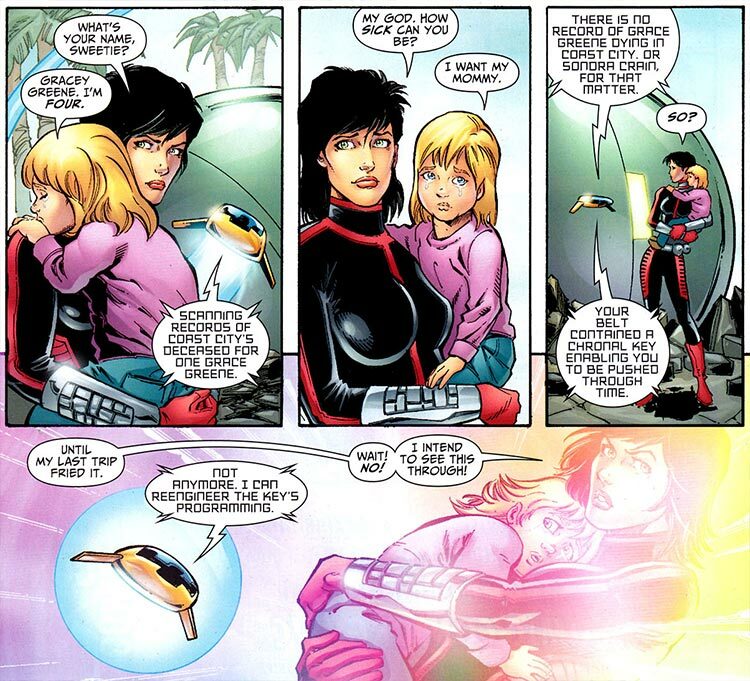 But I don't think Jurgens ever intended her to marry Booster Gold any more than he did Blair Butler or Power Girl (both hinted at in Booster Gold #28). You'll note that Sondra Crain was the least popular option in all three polls. For those too young to remember, Crain was anti-hero of "The Tomorrow Memory," climaxing in Booster Gold #30. Her goal was to prevent the past that created her in the hopes of making a better future. However, over the course of the story, she fails at her original goal. In fact, the only thing that she truly manages to accomplish is the salvation of young Gracey Greene. As you might have realized by now, Gracey is my guess for Booster's wife. Granted, she may seem underage to be romancing our hero, but that's only because you're not thinking fourth dimensionally. From the right point of view, she is nearly five hundred years older than Micheal "Booster" Carter. My guess isn't only based on Gracey's blond hair and fair skin. It also happens that Jurgens was working on Time Masters: Vanishing Point at the same time that "The Tomorrow Memory" was going to print. I don't think it's a coincidence he saved one person (only one!) from the destruction of Coast City in a story that was otherwise about how changing time was impossible unless he had a plan for that character. Am I right? Who knows. Given how notoriously tight-lipped Jurgens is about his intentions and abandoned story threads, it may be decades or more before we ever get an "official" answer to this question. Nailed it! Great minds think alike. And we know Jurgens, thats the way he thinks. If you had five Booster Gold autographs and Booster gave you seven more, how many autographs do you have? If a villain held ten hostages and Booster Gold freed seven of them, how many hostages remain?